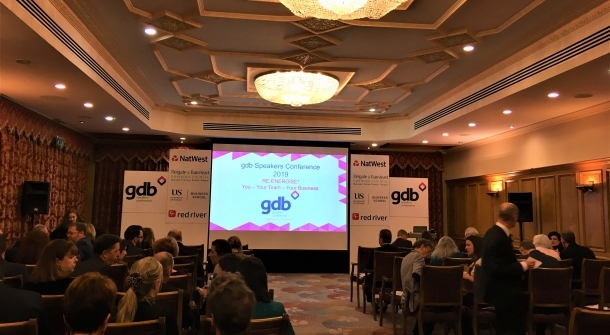 At the Gatwick Diamond Business (gdb) Speakers Conference 2019, attendees enjoyed inspiring and thought-provoking presentations on the theme of “Re-energise yourself and your business”. The conference was hosted by John Young - BBC South East TV newsreader and journalist – at the South Lodge Hotel, Horsham. Richard McCann stunned the audience with his harrowing, yet also inspiring, account of how as 5-year-old child he and his siblings were confronted with the murder of their mother - the first victim of the notorious Yorkshire Ripper. He had built on this experience, and the adversity and further tragedy that followed, to demonstrate how, having hit rock bottom several times, he somehow got back up again and again. Being on the ‘At Risk’ register, the loss of his two sisters and time in prison were just some of the challenges Richard had faced in his life. Yet he had risen above them to become a best-selling author in demand internationally as a motivational speaker and coach, inspiring others with his ‘I Can, I Will, I Did’ attitude. Julie Baker, Head of Enterprise for NatWest, highlighted how having a diverse workforce is an asset to any employer. She demonstrated how, despite real improvement, research shows that positive adoption of diversity in the workplace still has a very long way to go. Julie went beyond the theory and statistics to demonstrate how, through management commitment and a few simple steps to remove perceived and real barriers, a positive and pro-active approach to diversity improves business performance including profitability and growth. John Young, as well as hosting the whole event, took us into the demanding environment of a live TV newsroom – impossible deadlines, fast-changing priorities, technical and other communication challenges, and he need to balance risk – sometimes settling for good rather than perfect. In uncertain of economic times, John gave an inspirational insight into how dealing with the challenges of a live newsroom can translate into running a business – particularly into how to cope when things do not go to plan! Linda Moir shared her experiences as Director of In-Flight Services at Virgin Atlantic and later in leading the highly-acclaimed London 2012 Olympics Games Makers. She demonstrated, in a very practical way, how looking after your employees follows through into how they look after your customers. She explained how the 15,000 volunteer Games Makers had such a huge impact in making London 2012 such a success both as an event and in promoting a positive image of the UK across the world. Treating employees as individuals and allowing them to play to their strengths to flourish and grow was one of her key messages. Linda ended by playing the video London used in their bid for the 2012 Olympic Games, leaving everyone thinking, in the words of the theme song – “What have you done today to make you feel proud?” This could well have been the theme for the Conference as a whole. The event was one not to be missed, look out for details of the gdb “Re-energise” Conference in early 2020!